We recommend sending a post-purchase email to your customers. The content of your email could request a product review, be a note of appreciation, or provide a curated list of recommended products. The timing of this email will vary depending on the products you sell. We recommend thinking about how long it will take for your customer to receive their purchased items and give them time to enjoy their purchase. Customers who placed an order 7 days ago. Customers who placed their first order 7 days ago. Name the segment: Placed Order 7 days ago. Add the filter for order places between 7 and 8 days ago. Build a sentence for Count > 0 for Order Line Item Purchase between 8 days before now and 7 days before now. A post-purchase campaign on every order does not suit every brand. Some brands choose to have post-purchase campaign apply to only the first order. Name the segment: First purchase 7 days ago. Under the Engagement tab scroll down to First Purchase. The starting date field (left hand date field) select Relative, then 8 days before now. This segment targets customers who have purchased a particular category of item. This can be used in a campaign that sends information about a particular class of product or recommendations of complementary products. Name the expressions: Order Purchase Cell Phone. For the first block select Event Type as the field and order as the value. Add another block with Action as the field and purchase as the value. Add a block for the Category. 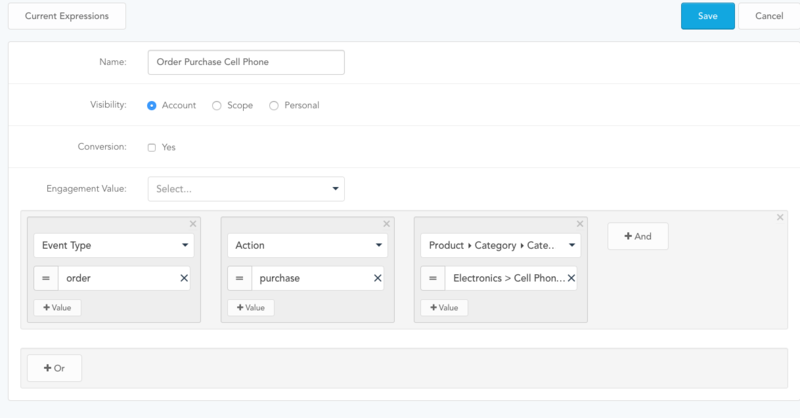 Select Product > Category > Category Path as the field and Electronics > Cell Phone as the value. We will now use the expression to build the segment similar to the Ordered 7 days ago segment above. Name the segment: Ordered from Cell Phone Category 7 days ago. Build a sentence for Count > 0 for Order Purchase Cell Phone between 8 days before now and 7 days before now. 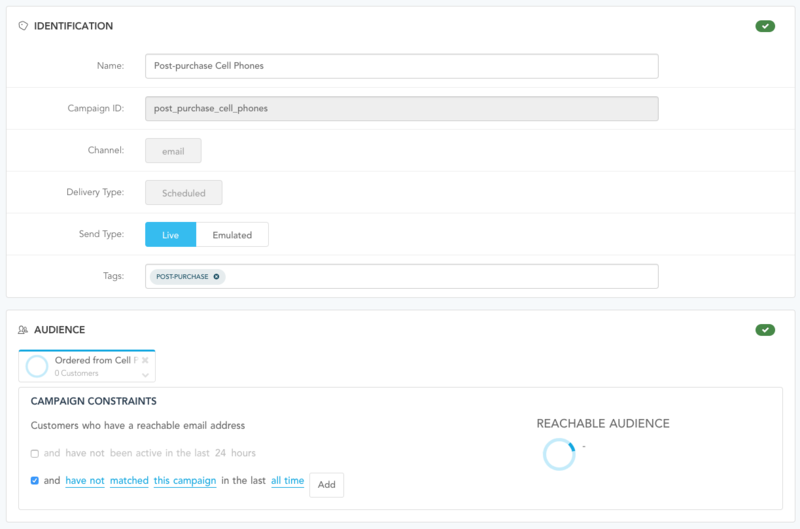 Ensure customers only receive the campaign once every 3 days: and have no matched this campaign in the last 3 days. We recommend sending this email on a daily basis at a fixed time in the morning. Set the delivery schedule to Recurring, repeating Daily, and repeating every 1 day and 9:00 AM.